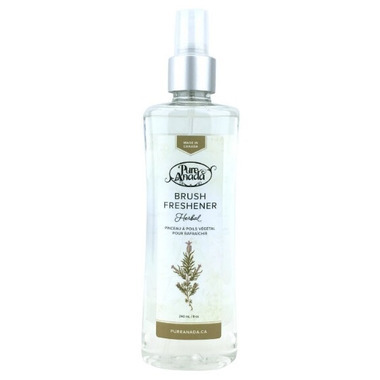 Freshen your brushes in between uses with their herbal brush freshener. Just mist your brushes and let them dry. How to Clean your Brushes: Pure Anada brushes can be shampooed. If cared for, their brushes will last a lifetime. They suggest shampooing your brushes with a gentle hair shampoo. Or, for a thorough, deep cleansing, you can even use an environmentally friendly dish detergent. This cuts through any oils and makeup residue on the bristles. Wet the brush bristles with warm water. Dispense some shampoo or dish detergent in the palm of your hand. Swirl the brush in the soap. Rise. Repeat until the brush is clean. Always lay your brushes flat to dry.